Public opinion about the environment is often marked by unwarranted pessimism about the state of our air, water, and natural resources. But the most recent government data show that America in general, and Michigan in particular, have seen impressive gains in environmental quality since the first Earth Day 30 years ago. 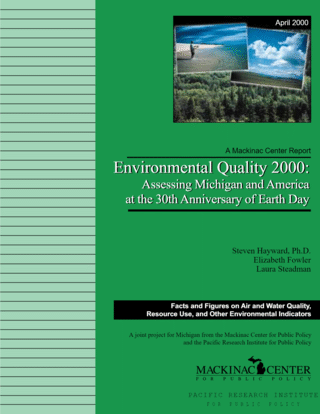 This report presents decades of facts and figures on Michigan and U.S. air and water quality, land use, and other environmental factors to show that, far from worsening, environmental conditions have actually improved substantially-and are likely to continue improving. The Rise of Environmentalism and the "New Regulation"